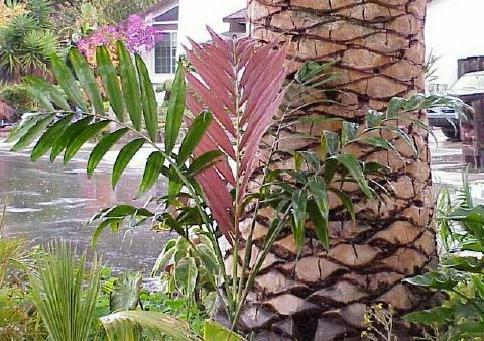 There are several common names associated with this palm; Red Leaf Palm, Red Feather Palm, Blushing Palm and most commonly in Northern and Southern California; Flame Thrower or Blond Flame Thrower. The new leaves open with a bright red coloration and slowly turn green after about two weeks. Threatened in native habitat due to mining of nickel ore; New Caledonia has more than 20% of the world's known nickel resources. This species is a popular and notable performer in Southern California but is still considered experimental in Northern California.